Autocross - Not the Place to Learn? While Toyota�s continued �juggernaut-status� and Nissan�s stunning turnaround have been grabbing headlines over the past few years, another Japanese automaker has been quietly making major moves of its own. Despite being one of Japan�s smaller car companies, Mazda has been cranking out some of the most desired-by-enthusiasts products as of late. They�ve always had the Miata, THE roadster of the 90�s, but the rest of Mazda�s product lineup suffered during the latter half of that decade. First came the Tribute SUV, developed with Ford, and the MPV minivan. Certainly, these two represent classes of vehicles that aren�t often associated with sport. Yet, Mazda has been able to inject a bit of sport into both. Despite their fun-to-drive qualities, however, both remain niche vehicles in their respective categories often overlooked by larger or more powerful entries. Mazda lobbed a major bomb into the midsize sedan battle not long ago with the Mazda6, the replacement for the long-forgotten 626. Like the MPV, the 6 was designed for a world market and thus packs wide-bodied American passengers in a bit tighter while most competitors like Nissan, Toyota, and Honda all designed their midsize sedans to meet Americans� demand for ample interior room. Thankfully, by not compromising for our added girth, Mazda was able to come out with a midsize sedan that is lighter on its feet than just about anything in its class. Styling inside and out is equally crisp, featuring Mazda�s signature 5-sided grille (that just about every Japanese company also seems to use as well...) and slant-eyed headlights. For once, international markets get the tacky clear taillights why the US market is spared. Unfortunately, US consumers didn�t take well to the new 6 as initial sales figures missed the mark. Things, however, have picked up since then as word spreads. The 6 has also been accepted surprisingly well in Europe, a market the Japanese are just now figuring out how to crack. Unfazed, Mazda is launching a 5-door hatchback (remember the 626 Turbo hatches of long ago?) and a wagon version in the US market as we speak. The Prot�g� has always been considered the enthusiast�s option amongst other compact sedans, and the MP3/MazdaSpeed Prot�g� has only enforced this point. The major thing the Prot�g� lacked was class-leading power. Mazda has gone a long way towards rectifying that with the new Mazda3, the successor to the Prot�g�. Based on Ford�s new global compact platform that will underpin the Focus and Volvo S40, the 3 is quite possibly the brightest example of Mazda�s revival. Not simply an all-out sports car like the new rotary-powered RX8, the 3 is a Mazda for the masses, one that could be used as a first car for a college-bound kid or baby-bus for modern families. Offered in traditional sedan or convenient 5-door hatchback, there�s a 3 to suit just about every need. Style-wise, the 3 is pretty much on an entirely different playing field than the rest of its class. The exterior is much more solid and classy-looking than anything this side of Europe. The interior, with few exceptions, would be right at home in near-luxury sedans and the 5-door much more useful that most compact sedans. Plus, by offering options like a NAV system, leather seats, and HID headlights, Mazda is making it known that this is not your average compact car. Like the 6, MPV, and others before it, the Mazda3 is laying claim to the title of �Japan�s BMW.� The handling is well balanced, refined, and downright fun. Ford was right to tap Mazda for the development of this platform, not to mention the fact that they�ve announced plans to utilize the Mazda6 platform for use under the Ford/Lincoln/Mercury brands. 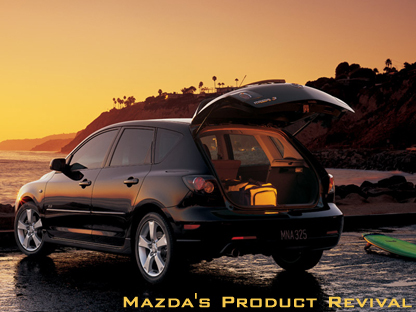 Mazda�s success is a simple example of offering great products at prices reasonable to the masses. It may take time for word to spread, but those wanting a sporting alternative to the mainstream brands will find their way to Mazda. The upcoming MazdaSpeed variants will only add to enthusiasts� desire for this brand. The only question remaining is, what�s next on the Mazda hit parade?